A few weeks ago a friend had a cookie making party. We all got together and made a bunch of different cookies. When we left we all got to take a few of each cookie. These bars were one of the "cookies" she made. I took them home and ate them the next day with my lunch. I was sad that I only had 2 of them. I think I could have eaten the whole pan all by myself! They have all the flavor of a key lime pie, but in small little hand held bites of heaven! I made them again for some friends we had over for dinner and they all loved them as well! 1. Adjust an oven rack to the middle position and heat the oven to 325 degrees. Line an 8-inch square baking pan with aluminum foil, allowing the extra foil to hang over the edges of the pan. Lightly coat the foil-lined pan with cooking spray. 2. For the crust: Process the animal crackers in a food processor until finely ground, about 10 seconds. Add the brown sugar and salt and pulse to combine. Drizzle the butter over the crumbs and pulse until the crumbs are evenly moistened with the butter, about ten 1 second pulses. Press the crumbs evenly into the bottom of the prepared pan. Bake until deep golden brown, 18 to 20 minutes. Cool the crust on a wire rack while making the filling. Do not turn off the oven. 3. For the filling: while the crust cools combine the cream cheese, zest and salt in a medium bowl. Beat until smooth. Add the condensed milk and been until incorporated and no lumps of cream cheese remain; mix in the yolk. Add the lime juice and mix slowly until incorporated. 4. To assemble: Pour the filling into the cooled crust and smooth with a spatula. Bake until set and the edges begin to pull away slightly from the sides, 15-20 minutes. Cool to room temperature on a wire rack 1-2 hours. Cover with foil and refrigerate until thoroughly chilled at least 2 hours. 5. Loosen the edges with a paring knife and remove from baking pan by lifting the foil extensions. Cut into 16 squares. Great recipe - saved this to make in the New Year. 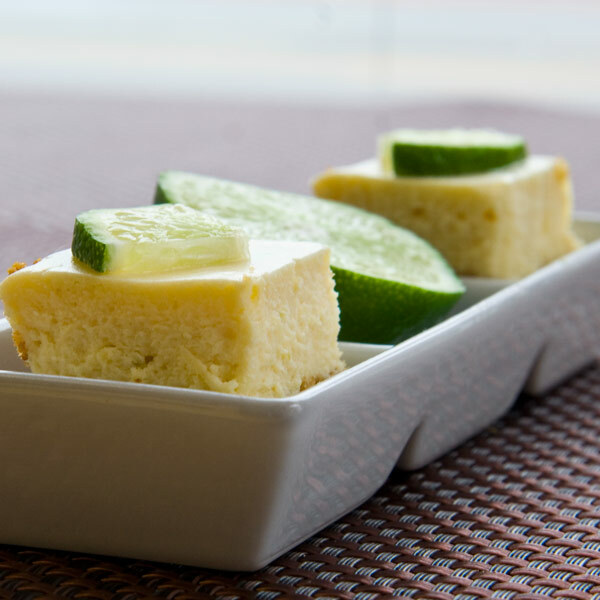 I never really liked key lime anything until I went Key West two summers ago, but now I can't get enough of it. I just love the sweet sour flavor, and it's so much better than plain old lime! These are right up my alley! They look so cute & yummy,easy to pack,I love that! This looks great! Thanks so much for the idea...and the Sugar Rush! I'm getting ready to make these and 2 oz of cream cheese doesn't seem like very much. Is it correct? Katie, I have made this exact recipe three times already. 2 oz. of cream cheese is *just enough* to add a little bit of creaminess and offset the sour just a little. This recipe is great as is!